Is this what our own Milky Way Galaxy looks like from far away? 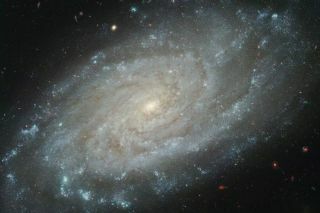 Similar in size and design to our home galaxy, spiral galaxy NGC 3370 is about 100 million light-years away, toward the constellation Leo. This article is Part One of Two in a series on the connection between the cosmos and spirituality. Check back at SPACE.com Friday (Jan. 21) for the series conclusion. Our sun is just one small point of light in the swirl of suns that shape the disk of the Milky Way. The galaxy's hundreds of billions of stars are strewn so widely apart, it would take a spaceship traveling at the speed of light one hundred thousand years to travel the distance. The starry wheel of the galaxy turns around a massive black hole, a point of infinite density with gravity so complete that not even light can escape. "They find it quite awe-inspiring, but in the wrong way," Gabor notes. "When I show people pictures of the local cluster of galaxies, just to give them a sense of the scale of things, the reaction quite often is, "Oh dear. I'm completely insignificant, and I'm uncomfortable about this whole universe thing." In Gabor's view, one way to counter this despair is to have faith in a higher power, to believe in a God that created the universe as a gesture of love. "Faith tells you that the universe is not something to intimidate you, but it is something given to you as a gift, by somebody who wants to give you something nice, something pretty," he says. "So looking at those astronomy pictures, you can either feel that the glass is half full, and believe that you're really being given something here, or you can feel the glass is half empty and this is just frightening and you want to hide in your little rabbit hole somewhere." Science, and particularly geometry and astronomy/astrology, was linked directly to the divine for most medieval scholars. The compass in this 13th century manuscript is a symbol of God's act of creation. The term "cosmos" means "ordered world." For most of recorded history, humans have believed that God created the ordered universe out of chaos. This belief is still shared by a majority of people around the world today, but aspects of that faith have changed as our scientific knowledge of the cosmos has grown. For instance, Gabor's colleague, Vatican astronomer Brother Guy Consolmagno, says that while many people believe God created the universe, they think its very enormity makes it impossible for God to take any personal note of us. This mote of dust we call planet Earth is insignificantly tiny in comparison to the smallest of stars, and each of our lives lasts for the briefest of cosmic moments. "Some people will refuse to believe because they still haven't grasped what kind of God we're talking about, a God that is so "other" that it is possible," says Consolmagno. This philosophical notion of a God for whom all things are possible, and who is beyond our basic human capacity of understanding, finds an echo in the still mysterious nature of the universe. For instance, most of the universe is currently attributed to the obscure categories "dark energy" and "dark matter." Writing in Scientific American, the astrophysicist David Cline noted those terms are really just expressions of our ignorance. Another area of scientific ignorance is the time before the Big Bang. What, if anything, happened before the universe began its current outward expansion? The Roman Catholic priest Georges Lemaître originally proposed the idea that the universe expanded from an initial point (which he called 'the primeval atom'), and the Catholic Church supported the Big Bang theory even before most cosmologists did. This "day without yesterday" was seen as being consistent with the creation ex nihilo (out of nothing) as described in the Book of Genesis. "The universe is not the result of chance, as some would like to believe. In contemplating it, we are invited to read for ourselves something quite profound: the wisdom of the Creator, the inexhaustible imagination of God, his infinite love for us. We should not let ourselves be limited by the concept of theories that only arrive at a certain point and which -- if you look closely -- are not set up as rivals of faith, but don't manage to explain the ultimate sense of reality. In the beauty of the world, in its mystery, in its grandness and in its rationality how can we not read the eternal rationality, and how can we do nothing less than to be taken by hand as it leads us to the ultimate unique God, creator of heaven and earth." "[Galileo] was convinced that God has given us two books, the book of Sacred Scripture and the book of Nature. And the language of Nature -- this was his conviction -- was mathematics, so it is the language of God, a language of the Creator. The surprising thing is that this invention of our human intellect is truly key to understanding Nature, that Nature is truly structured in a mathematical way, and that our mathematics, invented by our human mind, is truly the instrument for working with Nature, to put it at our service, to use it through technology." "Maybe it's a little bit of both," he says. "The thing that always astonishes me, beyond the fact that the universe is mathematical, the universe makes sense. The mathematics is beautiful. When a student grasps what Maxwell's equations tell them, there's this leap of joy that's as great as looking at the sunset that Maxwell's equations can explain. Why it should work at all is something no philosopher has been able to figure out." In Part Two of this article (appearing Friday, Jan. 21), the Vatican astronomers contend that many of the historical stories of the Church persecuting people for their scientific beliefs are inaccurate.